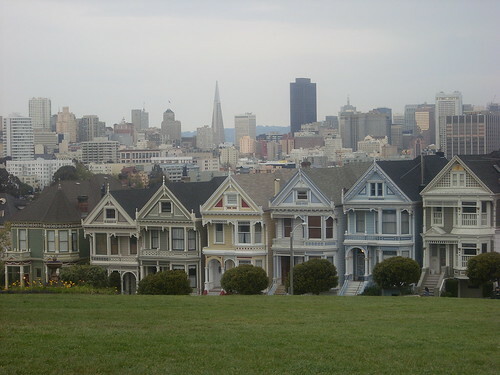 Beautiful houses, but not the 'painted ladies' I'm talking about. Not to get off track too much, but I think the family on “Full House” was supposed to be living in one of those houses, which is crazy, as they cost about $6,000,000 (I’m sure I’m low-balling the figure). The father hosted a morning show. No way could he afford the mortgage on any of those houses. Anyhoo, back to the subject of painted ladies. Back in the 1800’s, men would go west to seek their fortune. Wherever these boomtowns formed, “painted ladies” were sure to be there. How else could a man spend a month’s worth of wages in one night? Some of these courtesans were dressed more lady-like than others. Some would simply lounge about in their bloomers without a care in the world. This year’s Etheria event celebrates these painted ladies. 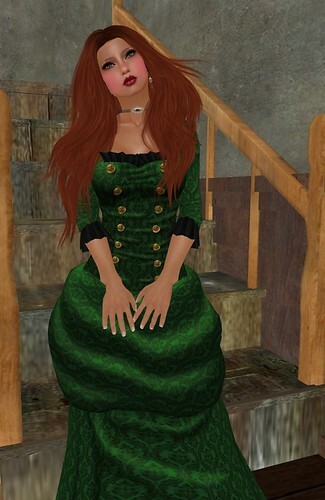 Some of Second Life’s most talented artists have paired up and recreated various period clothing and jewelry for this occasion. The pair I will be featuring in this post are Lolapop! (jewelry) and Schadenfreude (clothing). Schadenfreude designer/owner Allegory Malaprop outdid herself with her dress. It is a bit deceptive, to be honest, but brilliant. The dress gives the impression of a fine, upstanding lady, but in reality she is a courtesan that strolls about a crowded bar, gracing the prospectors with her presence. If you have enough money, she might be bothered to help you part with it. Lolapop! designer/owner Lola79 Hienrichs drew inspiration from Allegory’s dress, as well as from research she did for this project. The cameo and earring set comes in black and white and compliments the Schadenfreude dresses beautifully. The jewelry is simple, but elegant. These painted ladies were looked down upon by society’s well-to-do, God-fearing, Bible-thumping women. They were called tramps and whores by not only the those same church-going women, but by the same men who paid for their services. They were seen as trashy, damaged, dirty. Some may have even thought they were “taking the easy way out”. I don’t believe that for a second. The thought of sharing the vocation of these ladies makes me panic. They were strong women. You had to be strong to be in that line of service. I don’t think I have even half of their tenacity or resilience. You may not agree with their vocation, but you have to admire their will to survive and their willingness to do whatever it took to ensure their livelihood. Visit Etheria today! January 8th is the last day to pick these beauties up! This entry was posted in Blogroll, designers, Fashion, fashion feeds, iheartsl and tagged Allegory Malaprop, clothing, designer, elikatira, Etheria 2012, EverGlow, Exile, Fashion, hair, jewelry, Laq, Lolapop!, New release, Painted Ladies, Pink Fuel, poses, Schadenfreude, Second Life, shoes, Victorian, women's clothing. Bookmark the permalink.